If you’ve ever woken up one day and your neck felt stiff, it can really throw a wrench in the rest of your day. Any pain near or around the head is incredibly distracting and can make even the most basic tasks difficult. With that in mind, imagine waking up with that pain every morning, but instead it’s localized to your jaw. Chronic jaw pain caused by underling oral conditions like temporomandibular joint disorder (TMJ) affect millions of people every year. Thankfully, nightguards in Deland have the potential to stop much of the pain experienced from conditions just like this. Here’s how. What is Bruxism and TMJ? If you’re waking up with jaw pain, whether it’s in the morning or in the middle of the night, there are generally two culprits to consider. The first is bruxism, also known as chronic teeth grinding and clenching. Grinding and clenching are typically done unconsciously, so the person afflicted with the condition may not even realize it’s happening. This applied force can result not just in jaw pain, but worn-down enamel, cracked teeth and even an increased risk of decay. The other common cause is TMJ, which is a condition that specifically affects the joint that connects the lower jaw to the skull. This is typically developed as a result of untreated bruxism. As the joint experiences additional pressure, whether it’s while sleeping or throughout the day, it becomes sore and painful. Without treatment, TMJ can eventually cause neck and upper back pain, migraine headaches and a generally lower quality of life. Bruxism and TMJ are just two more reasons why visiting the dentist regularly is so important. In many cases, a doctor won’t be able to catch teeth grinding early unless you are already experiencing certain symptoms, such as jaw pain. At least when you visit a dentist, they can confirm that enamel erosion is present, especially of the canines or incisors which are supposed to be pointed. If these are beginning to wear down, it’s a sign that something is wrong. Enamel erosion, as well as other symptoms, can help the dentist begin building your treatment plan. Once they confirm that you have a teeth grinding or clenching habit, they can create a custom-made nightguard to protect your teeth. 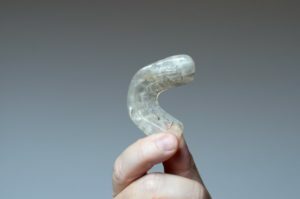 This device is much like a mouthguard you’d use in contact sports, but is typically clear and subtler compared to athletic variations. It’s customized exactly to your teeth and bite, so it will be far more comfortable than anything you’d find in a store. Once you start wearing one, your symptoms should begin to fade away almost immediately. Plus, you’ll avoid permanently damaging your teeth. Chronic jaw pain can be mitigated, but only if you visit the dentist for a diagnosis. Schedule an appointment with a dentist in Deland today to start building your treatment plan! Dr. Christopher Cowell earned his DDS degree from the University of Florida College of Dentistry. At his practice, you can receive a high-quality nightguard that protects your teeth from clenching and grinding, regardless of its cause. To learn more about his practice, you can contact him through his website.